The building project of our new temple has entered a new phase. Having completed the initial Schematic Design Phase in April 2015, we are now moving on to the second Phase, which is Design Development. This second phase will take much more coordination and resources than did the initial phase. The former Building Group did an outstanding job completing the first phase, but we are taking a slightly altered approach to this second phase. At the Annual Parish Meeting on November 8, 2015, it was decided to form a new Temple Construction Resource (TCR) Committee, to help us proceed with the building project. 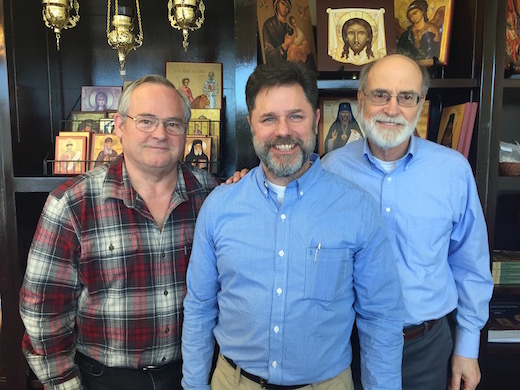 The TCR Committee currently consist of 3 enthusiastic parishioners who wish to cooperate to guide our parish in the realization of our new temple – Tryphon McKeehan, Nicholas Nachbur and Innocent Reishman (with Fr. Andreas as an ex officio member). They have organized themselves, and now meet at least monthly to develop the details of coordination, communication, inspiration and the gathering of resources (monetary and human) needed to build the temple. Everything we have – our time, our talents and our treasure, has been given to us by God. The TCR Committee will help guide our parish in giving back an additional measure of “Thine own of Thine own”.